ICAEA would like to pass our congratulations to Natália Guerreiro, founder of the Aviation English Hub, and ICAEA Research Group Member, on being awarded a Cambridge English John Trim Scholarship 2018. The scholarship will enable Natalia to attend the IATEFL Conference in Brighton (UK) in April 2018, where she will also join the TEASIG PCE on the theme of Listening Assessment. The Aviation English Hub has been an invaluable resource for many researchers since it was launched in 2012. 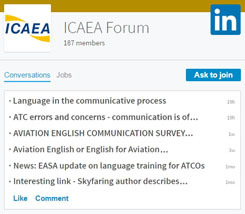 It provides an ever-growing catalogue of articles, dissertations, books, and other reading and audiovisual materials on the use of English in aeronautical communications. Contents span the language used by all aviation professions (eg: pilots, ATCOs, cabin crew, AIS officers, aircraft mechanics, aeronautical engineers, etc) working in both the civil and military sectors. Natália holds an MA in Applied Linguistics (Language Testing & Language Programme Evaluation) from the University of Melbourne, a BA in English & Portuguese from the Federal University of Rio de Janeiro, and a CELTA. She is currently working towards an MRes in Applied Linguistics at Unicamp of São Paulo, where she is researching the use of communicative strategies in Brazilian ATC communication. She has been working in Aviation English assessment and teaching for the Brazilian Air Force since December 2009.